Botanists confronting the confusing array of grass-like plants native to North America sometimes recite a mnemonic that begins “sedges have edges” to help them distinguish the genus from round-stemmed rushes and from true grasses which have hollow stems. The stems of sedges are V-shaped in cross section giving rise to the rhyme. With nearly 500 species, this largest North American plant genus can be quite a headache for botanists. Gardeners, on the other hand, will find it easy to benefit from the diversity of native sedges (Carex spp) and their ability to succeed in challenging conditions. Native plant expert and author Bill Cullina says sedges work so well in our gardens because their environmental niche is to “grow in the places where it is too wet, too shady or too infertile” for other plants to flourish. Resembling grasses and growing from rhizomes, sedges are generally clumping perennials; however, some species can grow together to form dense groundcovers. Several native sedges work well as edging plants and can take the place of non-native plants such as liriope. When grown as specimens, sedges provide texture and bright foliage complementing ferns and shady perennials. Properly sited, they require minimal care, and many are evergreen in our climate. 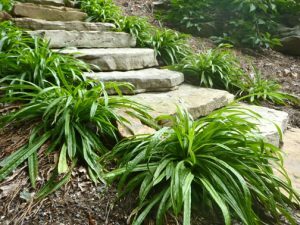 Sedges are ideal plants for sustainable gardens demanding few resources, but giving a great deal in return. Carex seeds are an important food source for songbirds. Their leaves support insects needed by birds to feed their young. Native sedges serve as host plants for 36 species of caterpillars including skipper butterflies. While sedges benefit a wide array of wildlife, they do not appeal to deer. 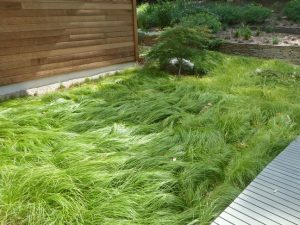 Appalachian sedge (C. appalachica), Pennsylvania sedge (C. pensylvanica), and Texas sedge (C. texensis) are all candidates for lawn substitutes in shady or part-sun settings. All three have narrow, arching foliage up to eight inches tall. Appalachian sedge thrives in dry, shady sites while Pennsylvania sedge can tolerate some sun with sufficient moisture. Texas sedge is tolerant of clay soils. Sedge lawns do not require mowing, but they can be cut back in late winter and once or twice during the growing season if a lower profile is desired. Either a string trimmer or a lawn mower on a high setting of four to five inches can be used for the job. Not all sedges have narrow, green leaves. Spreading Sedge (C. laxiculmis) is one of several species with wide, blue leaves. ‘Hobb’ or ‘Bunny Blue’ is a widely available cultivar that can be used en masse as a tough and durable evergreen groundcover. Spreading sedge is an excellent companion for spring ephemerals and other wildflowers. Seersucker sedge (C. plantaginea) has wide, dark green leaves that are pleated like the fabric. The evergreen foliage provides wonderful texture in shady spots with moist to average soil. Seersucker sedge makes a graceful edging for paths and borders. The plants can be cut back in late winter to keep them tidy and to make the spring blooms more visible. Although not show-stopping, the purple bloom spikes are quite attractive. 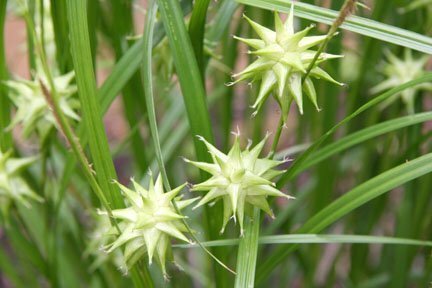 Gray’s sedge (C. grayi) draws attention not for its flowers, but for its dramatic seed heads that develop in spring and remain attractive throughout the growing season. 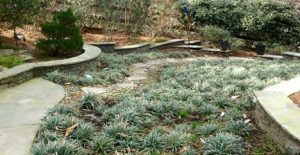 Creating a two-foot mound of evergreen foliage, Gray’s sedge is an excellent choice for rain gardens and other sunny, wet areas. While deer-resistance and low-maintenance requirements are reasons enough for most gardeners to consider planting sedge, the important role they play in sustaining songbirds, butterflies and other wildlife really give them an edge.